1. Take a cooker/ sauce pan. Put some oil into it. Now add mustard seeds and jeera. 2. After they starts spluttering, Now add onion and ginger garlic paste. 3. After the onions are translucent, add tomatoes and saute them. 4. Now add Lima beans, salt, red chilli powder and dhania powder. 5. Add 1 cup of water and pressure cook it. 6. Switch off the stove after 2-3 whistles. You can enjoy this recipe with Roti. It will be awesome. Note: Here I used the frozen lima beans. You can cook with fresh beans also. In that case adjust the water in cooker. Probably you may need to add 3/4 cup more water. 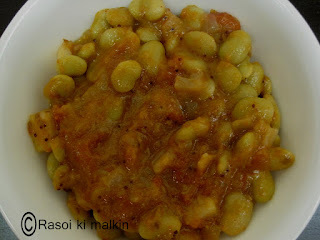 You can also substitute lima beans with batani/ rajmah.